So in my vast reading, watching, podcast listening media consumption I was introduced to the rib roll. I can’t quite remember where to give due credit. I remember some forum posts with decent pictures, maybe some videos. There might even be a post in the blogosphere on it. This method is used by western, backpack, mountain hunters to get boned out rib meat off a large animal packed out to the trail head. Out west animals are bigger, Mule Deer bucks sometimes well over 200lbs. Medium elk double that. Moose double that. In some states there are wanton waste regulations that require rib meat to be retained. My animals aren’t nearly so big. A big whitetail for me is a 150lb buck, and that is only every few years. 100lb does are much more common. I’m always looking for new cuts, better ways to utilize meat and increase yield. A few years ago, prodded by Steven Rinella’s deer rib video I started saving and cooking whitetail ribs. It’s a damn shame so many people throw them away. They are really good, and worth keeping. They don’t have a lot of meat, but enough to take the few minutes to keep them. In the future, I’ll do a dedicated deer rib post, but the basic overview is that you need to cook the ribs low, slow and wet until they are fork tender. There are three options to do it. Crock Pot, pressure cooker, or braised in a conventional oven covered in broth. The cooking needs to be done when you put them on the grill. I have a smoker, and I prefer to use that. The problem with deer is that nasty tallow that coats your mouth. It’s no good. The trick is to let it drip off over a hot fire. You don’t want to scorch the ribs, but you want to brush them with sauce and get them over a good hot wood fire for 8 minutes or so per side. Too long and they will dry out. Last summer, I was turned on to a method of cutting rib meat that keeps the side meat from the hind quarter to the neck in one great big boneless sheet of meat. The rib roll. I don’t need to quarter animals to get them out of the back country, so this is purely a play on butchery for me. When you skin your deer, you need to do your best to clean skin it. Most people end up leaving some of the side meat on the hide because it is just the easiest way to skin. And nobody uses that thin, tough side meat anyway right? The goal is to have no meat left on the hide. Extra points if you use that nice clean hide to tan and hang on the wall. Might make a post on that some time in the future. So, after you clean skin, split off the shoulders, taking care not to cut into the side meat too much. Go ahead and pull the back straps. Then cut the flank from the hind quarter. Let it hang down and start to fillet the meat off the back rib bones. This is tricky. 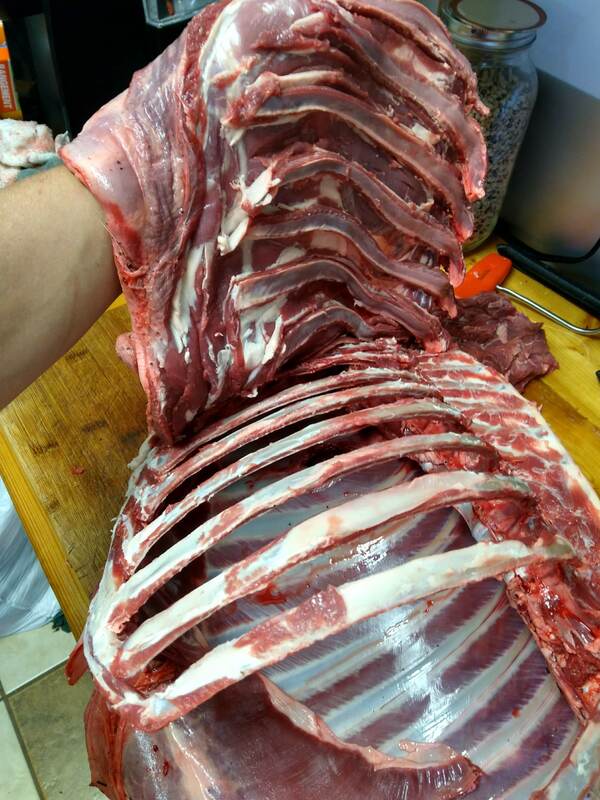 You need to score the backside of each rib, then fillet off the rib meat from the rib bone. Score, fillet and repeat until you get to the front rib. Then just continue on into the neck as you would normally debone it. The goal is to have one flat sheet of meat from flank to neck. Once I have the sheet of side meat free on the block, I will trim away any bloodshot, and then give it a good rinse in the sink. You would be surprised how much bloodshoot can be rinsed away. I do not simply cut it all away as most of it is coagulated blood trapped in the fascia. The meat itself is fine after this. I believe my 100lb does yielded about 5lbs of side meat per side. I would cook this just like a whole rack of bone in ribs. I used to be scared about all the fat in ribs. An early season deer can be quite fatty. But I discovered after messing with deer ribs a few times, the white fat is only a carrier for the tallow. Slow cook it, then hot fire and the tallow drips out, while the white fat carrier is mostly left behind. I like a good mustard based bbq sauce. Use whatever kind you prefer. I happen to like what’s classified as a Carolina sauce. Usually heavy on mustard, vinegar and sugar. Probably no coincidence since I’m very near that region. My sauce is so good, I’d like to share it in another post. It is mostly adapted from a recipe I found online, but I have made some changes. I think the acid in the mustard and vinegar helps cut any tallow that may be left. If this method proves to be just too much to visualize from text, I may make a video about it. Comment if you think that would be helpful.